with the mandate of the CARTA program which is to strengthen human resources and university-wide systems critical to the success and sustainability of research productivity in public and population health. It is expected that these workshops, and other institutional capacity strengthening activities, will rejuvenate institutional teaching, research, and administrative systems at participating African universities. Participants at the workshop included 45 teaching and administrative staff and librarians drawn from the nine participating African universities. 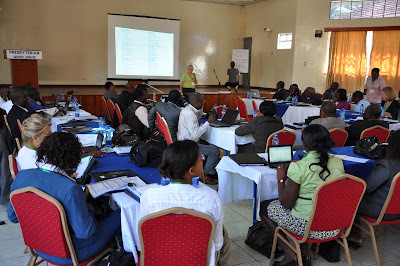 The workshop was facilitated by resource persons were established researchers, administrators, and librarians from both African and northern CARTA member-institutions. . Themes covered included curriculum development and funding for research, teaching skills, supervision and mentorship, managing research, managing research process, getting published; developing and implementing an Institutional Research Strategy; research governance and management; and identifying sources of funding for research.